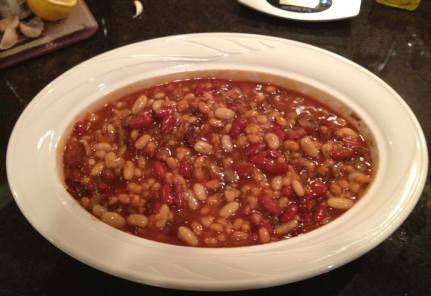 This delicious and easy-to-make baked bean recipe has been my go-to solution for picnics, family reunions and holiday gatherings for close to two decades. I named it after its creator, my college roommate’s mom. (Madeline is hands down one of the best cooks I know). Fry 12 – 16 oz. bacon* (preferably center cut) with 1 finely chopped small (or 1/2 – 3/4 large) onion. With a slotted spoon, remove bacon and onions from pan and place on folded paper towels to remove excess fat. Crumble bacon and add to bean mixture. Bake uncovered at 350° for 45 minutes. *Tip: cut the bacon into 1 inch pieces prior to cooking or fry until crispy so it crumbles easily.